I wrote about the Parker 75 Thuya some months ago but recently I managed to win Parker 75 Cisele Sterling Silver on eBay. It came all the way from Portugal. I think it’s fair to say that it is one of the best fountain pens ever made and it remained very popular during its 30 years of production until it was finally withdrawn in 1994. 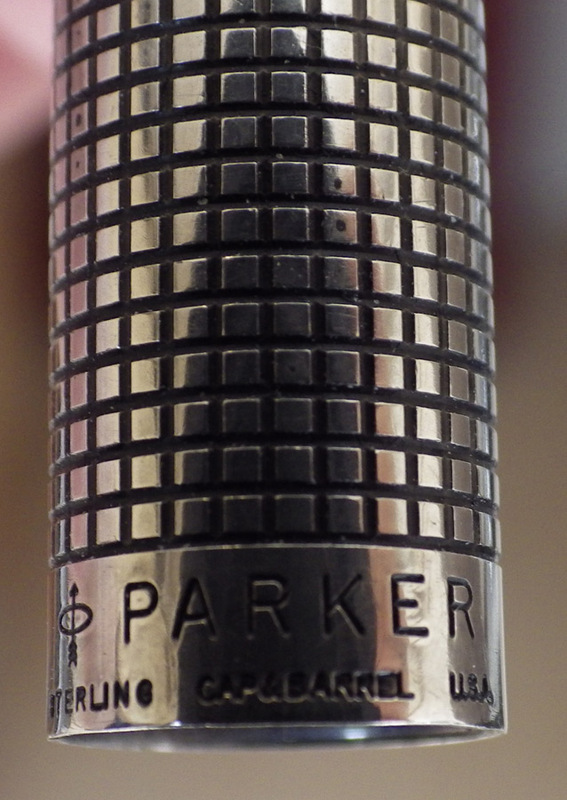 Prices for second hand Parker 75s today suggest that Parker may have withdrawn it too soon as it is eagerly sought after and expensive. So what makes it such a great pen? For a start, the fact that it’s sterling silver and it has the very fetching chiselled crosshatch pattern with gold plated trim makes it very visually appealing. I find myself constantly turning it over in my hands and enjoying it. Opening the pen shows a wraparound nib, not dissimilar from the Parker 65 nib I wrote about yesterday. The calibrated dial between the section and the nib allows the user to set the pen to his or her own requirements. The tapered section provides a triangular grip which is comfortable for the user, a feature much copied since. It is a cartridge/converter pen and this one has the converter fitted. So that’s a Parker 75, one of the finest pens produced post-war. I can only say that the hype is not misplaced. It looks as good in actuality and feels as good as you might have imagined. Apparently there were about 11 million sold, so everyone has a chance of getting one! On another topic, I’ve been buying in calligraphic material – lots of calligraphy pens and a huge supply of cartridges. I’ll be putting the pens up on the sales site as soon as I get them catalogued, but it’s not worth putting the cartridges up there. If you’re looking for inexpensive cartridges, drop me an email. I have Pilot, both blue and colours, Manuscript, Stypen. Rotring, Lamy in various colours and even some of the old Osmiroid cartridges. There may be some others, so if you have a particular requirement not mentioned, just enquire. So how does this work? What happens when you turn the “dial”? This was a feature that first appeared in the Parker VP. Bearing in mind that the triangular grip is immovable, rotating the dial turned the nib to the user’s preferred angle. This was especially useful for left-handers, but also for right-handers who rotated the pen – i.e. those who usually use an oblique nib. 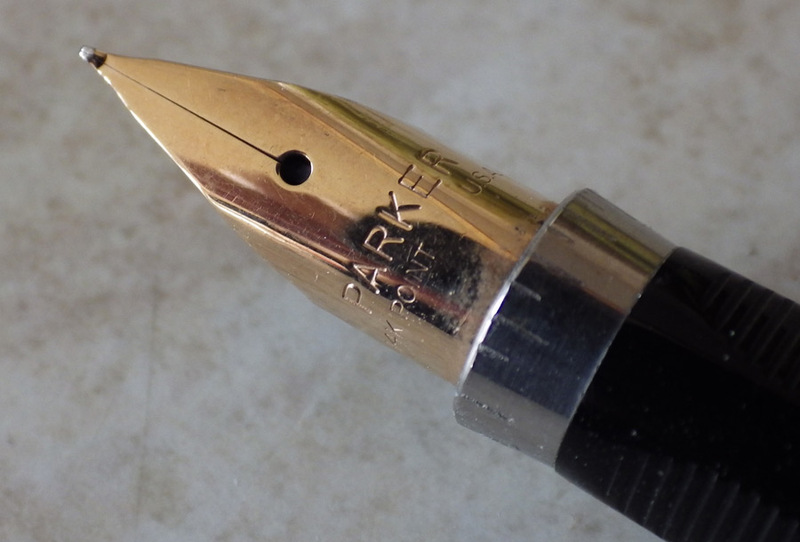 What would you recommend to use for a tarnished Parker 75 Sterling sliver fountain pen which has been laid idle for years unused? Would using Brasso be acceptable? I would avoid Brasso. It’s very coarse and may contain some components that are bad for pens. I know that it is generally frowned upon in the pen world. I would suggest Jeweller’s Rouge Silver Polish Polishing Cloth which you can buy on Amazon.